A horrifying tale made headlines this week after three women, held captive for decades, were abruptly freed in an escape aided by a neighbor. What we know about the event is that a concerned neighbor, hearing the cries of one young woman and suspecting domestic abuse, kicked in a door to free her. Her subsequent 9-1-1 call and rescue of her and her companions by police made national headlines. The story is still unfolding. The man, Charles Ramsey, is a colorful personality who seems to have a knack for creative sound bytes in news interviews. Even fast-food chain McDonald’s, prominently mentioned as the food of choice by the local hero, restrained itself in turning it into a publicity opportunity–likely out of respect for the families and their privacy. Internet sensations like these seem to pop up regularly and oftentimes a company must decide whether to jump on the publicity bandwagon or to pass up the opportunity in the interest of courtesy or human dignity. As we watch this play out in national media, let’s see who takes the high road. This man is more than a hero, he saved another woman’s life. If I would have been in her shoes I would have forever been grateful to this man. He was in the right place at the right time. Had he not heard her cries, he wouldn’t have been able to help her/free her from this tragedy. I cannot believe that people do this to other human beings, what has this world come to. I do not know how people think that actions of this nature are acceptable. These women were held captive for decades, who knows what had happened while they were held captive. I appreciate the effort McDonalds had made to praise this man for his hard work and all of his efforts. He is truly a wonderful person, we need more people like him in this world. I would forever be thankful. Charles Ramsey was definitely in the right place at the right time. As far as the news and media has put it, he did all the right things to help the 3 women and get authorities on the scene and help these 3 women to safety. Right now, him being at the right place and time, he is a huge part on the story, and McDonalds got their free publicity because of one simple comment. McDonald’s did in fact take advantage of it, and reaching out to Charles, but it is all for their own personal gain, and image of the McDonalds company. It was a interest in courtesy, and Charles Ramsey declined the reward, and told them to give it to the 3 victims, which he could have kept for himself, but refused, now that was an act of human dignity. What Mcdonalds did was interest in courtesy. Actually, I remember that I firstly heard this news from the Internet. I was so sad, it was exactly a horrifying story and very unbelievable. I really don’t know what happened to these three wretched women while they were held captive, but I can image that they should be treated rudely. Why are there such terrible people like suspects in the world? In addition, I totally agree that this man, Charles Ramsey, is more than a hero, he was really in the right place at the right time to save the three women’ lives. The Internet must celebrate our heroes. The public also need to learn from Charles Ramsey. What’s more, based on the Internet, he takes immediate action when crisis occurs, and remember the small details. When crisis happens, he was so brave and selfless. As Sabina said above, the world definitely does need more people like him, and then I believe the world will get much better. Thank god he was there that day and god bless him! I think he is a good person for what he did. It did make me think though. What kind of person would see or hear people screaming for help and then go back to what ever they were doing and not do anything at all, just pretend it didn’t happen. I think anyone would at least call the police and report it if they were too scared to actually go over there themselves and check it out. I have to agree with Wilson. If the screaming was consistent, then the man should have done something earlier. However, he still did something which is why he is in the headlines and not back home on his couch. I had same feeling with you when I read this news from the Internet because it is so horrible story which I can’t image. 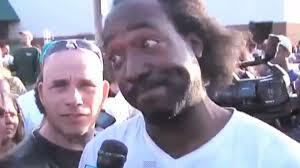 It’s fact that Charles Ramsey is a hero because he was in the right place at the right time to save 3 women’s lives. He mentioned that when he ate his McDonald’s burger… then.. I think that if McDonald want to offer free meal to Ramsey, that is a good idea that encourage that people like him so brave to help people when someone need your help. It will let our world become better and decrease crisis and violent issues. After the Internet sensation about Ramsey, most people seemed to settle on free McDonald’s. McDonald’s heard the calls for free burgers and the local owner-operators of the McDonald’s restaurants in Mr. Ramsey’s neighborhood have connected with him and offered complimentary McDonald’s food for the next year, but not for life. The company didn’t make a public announcement about this because the company wanted to be respect for the survivors of this harrowing ordeal and the ongoing investigation. To me, what the company did is ethical. Since, Internet sensation is becoming more and more frequent event, companies should make deliberate decision on which Internet sensation they want to use as publicity. Because some of them bring good impression and perception about the company, but others may just a waste of money. I think having a colorful figure like Ramsay was a blessing for the women and the families involved in this tragedy because it took the spotlight off of them and pointed it on Ramsay. After going through what must have been a horrific experience hopefully these women can stay out of the spotlight as they try and piece their lives back together. I agree, it must have been comforting to have a little bit of the spotlight averted in order to regroup and process all of the traumatic events that transpired so quickly. Since the time of the article there has been a TV series made about this event and this man was even featured (at least, his personality). It’s amazing how being in the right place at the right time changed the lives of these women so dramatically, and the life of this man as well. We haven’t seen much of Chuck lately, but he is still kickin’ it and working out deals. Here is a current article about how he has signed on to be represented by a celebrity speaking firm. The article says that Charles will get paid $10K to make appearances and speeches. There has also been an online game created called “Charles Ramsey’s burger bash” which Mr. Ramsey is unaffiliated with or approves of. It has users throw burgers at Castro while sound bites of Charles famous lines about a white girl going to the arms of a black man plays in the background. Other offers for free burgers for life from other restaurants continue to pour in, but Ramsey only accepts the offer from McDonalds and his former place of work, Hodges. I have been very impressed with how this man has conducted himself through this process. I imagine it is very tempting to “cash-in” on his fame. At every step, he has directed attention back to the victims and their families rather than trying to capitalize on their misfortune. Is it sad that this seems so exceptional? It was horrible thing that happened to those women, and it’s really hard to imagine that no one ever know that they were kept in the basement of the house in the past 10 years. Charles Ramsey happened to be at the right place and right time, and he choose to do the right thing which saved those women’s life and made himself a hero. I remember when we discuss about this case in class, we agree that it would be better for McDonald to response with supportive action to the victims rather than provide free burger for Ramsey, which turn out to be the way their PR team handled it. Knowing how this plays out, I’m glad McDonald’s decided to play it safe from a PR standpoint. They didn’t use this as an opportunity to boost their own name or try to sell their products, they simply recognized that this gentleman did a heroic deed and that he deserve something for this. They did a great job with a very delicate situation and came out a stronger brand because of it. I am not sure what to think about this situation. I would argue that McDonalds has exploited the situation by using Charles Ramsay’s instant popularity as cheap advertising (since he loudly announced on all channels that he was eating a Big Mac shortly before rescuing the women). I wonder about the ethics of the situation, given that so much pain and suffering was involved for these women who almost spent half their lives in captivity. I remember my first thoughts after I heard about: It just appeared greedy to me that McDonald’s would draw some of the attention to their business that actually should have nothing to do with the heroism and happy ending of the story. I am disgusted by that, the same way I have always been disgusted by their products. It is now exactly one year later and I wonder if McDonalds had been holding up to their promises. I also always wonder how such promises are executed in reality? Will they give him an in-store-credit card? Or coupons? Just curious. In this situation I think McDonald’s did the right thing in not over using this publicity to benefit their brand. This was such a tragic incident for those three girls and the child born into this abusive life. I don’t believe Charles Ramsay intentionally mentioned McDonald’s to be funny I believe he was just being himself and talked in the manner he would talk to anyone. In this case McDonald’s got free publicity out of the situation but shouldn’t go beyond that with using that statement. The women deserve their privacy and to work on regaining a normal life back without companies interfering for their personal benefit. These women are very lucky as if Charles wasn’t there at that time they were crying they wouldnt have been rescued and they wouldnt have gotten any help from anyone. This man is a great legend who saved the lives of these women who were held captive. McDonalds took advantage of this situation from one simple comment by reaching out to Charles, but it is all for their own personal gain, and image of the McDonalds company, however supported Charles till the end. But all the appreciation has to go back to Charles who actually saved their lives. McDonalds made a fantastic choice to stay out of this one. They got the PR from Ramsey himself, and they were wise to not turn a tragic situation in to a media opportunity. McDonalds has a poor overall reputation for their food and its low quality. But I have to give them a lot of respect for this. It was probably not an easy decision to choose against pursuing this PR opportunity, and it would have probably made them a lot of money. The company showed that there are more important things than getting good publicity. This story is crazy and I was following it pretty closely. Someone even ended up getting a Charles Ramsey tattoo on his leg. I think this story was so big was because of the length of the kidnapping and the personality of Charles Ramsey. In the TV interviews he was always thoughtful about other people and talked about doing the right thing. But at the same time he had a uniqueness about him that was charismatic. I wonder what he is up to nowadays. McDonalds made a good decision to reach out to Ramsey. They’re not exactly known for being high-brow so this PR move fit their brand image. Charles was definitely in the right place at the right time, and I remember hearinf the story on the news As far as the news and media has put it, he did all the right things to help the 3 women and get authorities on the scene and help these 3 women to safety. Right now, him being at the right place and time, he is a huge part on the story, and McDonalds got themselves some free publicity because of one simple comment. McDonald’s in my eyes took advantage of the situation, and reaching out to Charles, but it is all for their own personal gain, and image of the McDonalds company. Charles Ramsey declined the reward, and told McDonalds to give it to the 3 victims, which he could have kept for himself, but refused, for me that was human dignity. What Mcdonalds did was just taking advantage of a already difficult situation. If it was for the fact of actually helping him out they would have done it in private and a while after all the drama around the actually story would have settled and not right in the middle of all this. In my eyes it made them look less tactful than the story portrays. I can imagine how hard it must be as a company, to make sure you are handling a sensitive situation like this well. It is so hard to fully understand and predict how the public is going to react to any type of company reaction. It’s important to carefully analyze the situation from all possible perspectives. Wow did not realize McDonald’s tried to get PR out of a story like this… Even in an attempt to be tactful, the company did not succeed in my opinion. It appears that they could be trying to reward him but, it also seems inappropriate to reward someone for reporting an extraordinary amount of abuse. I watched some news reports of the incident after reading this post, and it seems there were clues this man was very mentally unstable, he had beaten his wife in the past and taken his children against court order. Incredibly disturbing that he did not get caught for over a decade. Even his son witnessed the locks on his attack and garage and never looked into it. A truly tragic story. This heroic news story caught the attention of social media users everywhere. Not only was it turned into an extremely clever and viral Auto-Tune, which features Charles Ramsey singing his now well-known single, “Dead Giveaway”: https://www.youtube.com/watch?v=7b3rdwhaz48. The interviewee’s mention of McDonald’s within his news story also caught the attention of McDonald’s itself. I think that McDonald’s was very tactful in the way that they handled the brand opportunity. McDonald’s was sensitive to the situation, but also listened to their social media followers, who requested the company to give back to Ramsey. McDonald’s was also debating on signing Ramsey as their new spokesperson; this was a great way of turning breaking news into a great business building and branding opportunity for their company. Recent news on this story indicates Ramsey didn’t get signed with McDonalds after all, although he received $2,000 in gift cards from the company, which he selflessly handed out to the homeless. While this story is serious and it’s sad that it happened, I find it extremely funny that McDonald’s used all the publicity as PR credit. It just goes to show how desperate the company really is. This happened roughly two years ago and the company still today is not doing very good. McDonald’s is losing its brand image exceedingly fast and it needs to reevaluate where it sits right now in the market in order to strategically get itself back in the game. Something really interesting about this is that Netflix’s new hit show Unbreakable Kimmy Schmidt is a loose satire (maybe not a properly respectful term to use here) of this event. Without crossing too many lines of offensivity, Netflix and this show’s writing staff seem to have leveraged this terrible event and turned it into a hit television show. The underlying tone of this article is sad, yet the online community finds it in themselves to make light of a serious situation. While the focus may be on the viral interview, McDonalds seemed to make a desperate attempt to hop on a viral sensation bandwagon. They honestly should have picked a different trend that didn’t have such a dark background. At least for me, this does not help McDonald’s brand image. Viral videos are so common, but not always under such unique circumstances. The situation was horrible, but the Hero, Charles Ramsey, had too much character to deny. McDonald’s handled the publicity tastefully, keeping a distance, yet acknowledging Charles and the public. As a company, you always want to respond public attention, yet it is not always clear when or how it is appropriate to do so. Especially when it is viral, delicate topic, and opinions on the best way to react will likely be divided. This guy did a really good job by helping those three women. He should be deserved. Reading this article, I felt that McDonald just used this guy to tell people that McDonald is the company that admires a person who helps people. I think as a marketing strategy, the company made a wise decision by using the guy. However, the action really contradicts what McDonald does. The company is one of the biggest contributor that make people in the world diabetes and unhealthy. There may be a possibility that the guy is anti-Mcdonald and reject the company’s offering. If so, the company would have a bad result from the company’s decision to offer a prize to the guy. PR is all about associating or disassociating from a person or event. I think that it is very important to see that in a situation like this, it’s probably better for McDonald’s to stay away from it, because the story is so sensitive and so weird. You see this all the time in PR. An advertiser will stay with an athlete until that athlete becomes too controversial and then they dump them. They were with them in the first place because they wanted the association, and they dump them because they don’t want the association any more. Despite it being free publicity, why would McDonald’s associate itself with a story like this? They were smart to handle it in the way that they did.